We've been talking about getting a dog for a while now. I have wanted one ever since I can remember and now that we're settled in to the house we thought it was about time. Dogsitting Shelby only fueled the fire. Shelby's Daddy, Dave, got her from his sister whose dog had puppies around this time last year. Dave knew we wanted a dog and knew of my near obsession with Boston Terriers. 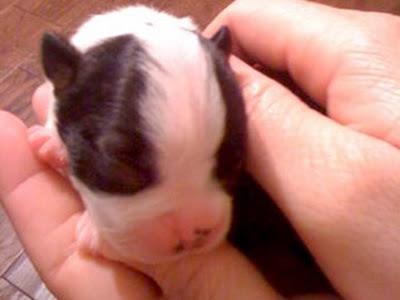 As luck would have it, his sister's dog was having puppies again this year. Yippie! 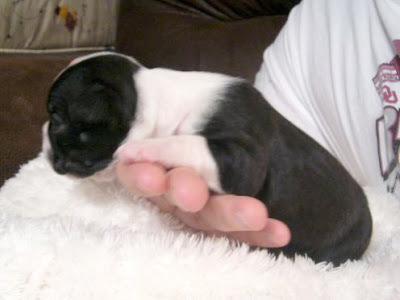 The pups were born on November 12 and will be ready to leave their mummy right around Christmas. We have dibs on one of the girl puppies. This is Sophie. I'm sure Biscuit will be thrilled! By the way, how soon can I come back again?!!!! Congratulations on your new addition!! Can't wait to meet the little one. Adorable!!! Congratulations! She looks like she will be a great new friend for Zuzu! Thanks everyone! I hope you are all able to meet Sophie sooner rather than later. Joanie, you guys are welcome back any time! Congrats Jen and Rodney! She is really cute.